Today it is July 26th Saurday. Yes, it is a last weekend in Shirahama, Shimoda. I was cleaning up the guest rooms but I went to the beach to take pictures because it was very beautiful today. I took this picture in fron of Shirahama tourist office. There were a lot of people on the beach today. I am showing the another picture which I took on the top of mountain….. 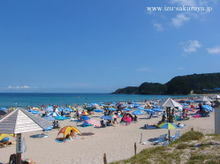 I think Shirahama beach was occupied 60 % of parasols. By the way it was very hot here in Shirahama today. The temperature is higher and higher day after day in these days. The weather forcast says that it would be sunny and hot next 1 week in Shimoda. If you would like to get summer why don’t you come to Shirahama? 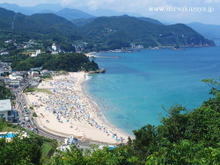 This entry was posted in beach on 2008年7月26日 by izusakuraya.